An expedition to a previously undiscovered island leads to the discovery of the eighth wonder of the world. 2014's Gareth Edwards helmed Godzilla kick-started a shared universe with the eighth wonder of the world, King Kong. Three years later we get the second movie in the franchise, which gives the great ape his chance to take centre stage before battling Japan's favourite giant lizard in a monster mashup set for a 2020 release. 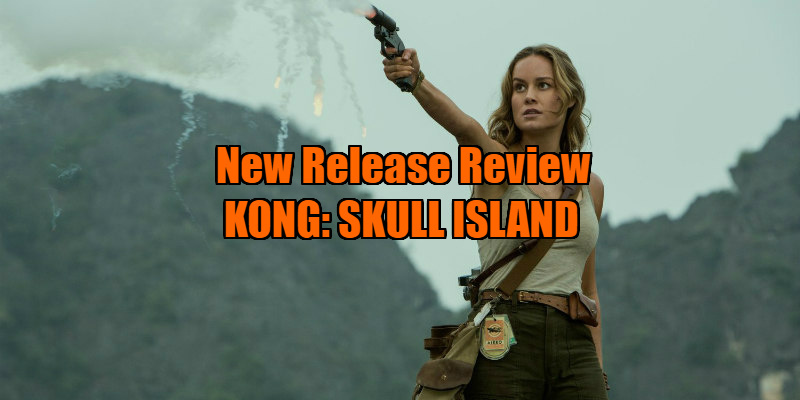 Set in 1973, Kong: Skull Island serves as a largely unrelated prequel to Edwards' movie, as an expedition force led by Monarch, - a group of scientists obsessed with a theory that there's a hollow layer beneath the surface of the earth which may house previously undiscovered life-forms - heads to the eponymous destination on a hunch that it holds the secret to clarifying their beliefs. Heading the group is Monarch supremo Bill Randa (John Goodman), who takes advantage of the evacuation of US troops from Vietnam to enlist a group of soldiers led by the war-mongering Colonel Packard (Samuel L Jackson). Also tagging along are photo-journalist Mason Weaver (Brie Larson) and ex-SAS mercenary James Conrad (Tom Hiddleston, miscast in a role that's crying out for Jason Statham). Godzilla divided audiences like few blockbusters of recent years. While many appreciated Edwards' restraint in showing the titular creature, most viewers complained at the lack of monster action. It seems the producers of Kong: Skull Island have taken this into account, with the trailers showing us Kong from every conceivable angle. Having featured so heavily in the marketing, you might expect Kong's appearance in the film to be something of an anti-climax, but nothing compares to seeing the big guy on a giant IMAX screen. The movie doesn't waste any time in introducing him; it's a mere 20 minutes or so before he arrives roaring and rampaging in the film's standout sequence, as he slaughters half the cast, hurling tree trunks at choppers and stomping on fleeing insect-like humans. Director Jordan Vogt-Roberts, taking a giant step from his indie comedy The Kings of Summer, does a fine job constructing this sequence, commendably avoiding shaky-cam and quick cuts, allowing us to enjoy the simian smackdown in all its chaotic glory. Later he shoots a brawl between Kong and another giant inhabitant of the island in the head to toe fashion of a Fred Astaire dance number, letting us bask in its scale. I'll always have a personal preference for Willis O'Brien's stop-motion creation from the 1933 original, but Kong as presented here is the most life-like we've seen him to date. Unlike previous versions, there's a lot less anthropomorphism with this Kong; he's allowed to be a big scary beast here. Where other movies have given him human-like features to elicit sympathy, Kong: Skull Island instead gives us an outright human villain in the form of Jackson's gung-ho Colonel, who comes into conflict with the rest of the expedition with his determination to napalm the beast, desperate for a victory having lost Vietnam. The trouble with Kong: Skull Island is it repeats the main issue of Godzilla, only more so. If you thought Edwards' film had poorly sketched characters, it's practically Jaws in comparison to Vogt-Roberts' movie. Like the disaster epics of the period it's set in, Kong: Skull Island fills the screen with so many characters we don't get a chance to get to know any of them. Oscar winner Brie Larson? Completely wasted, and present simply to look good in a tight vest. Golden Globe winner Tom Hiddleston? Gets nothing of note to do and is thoroughly unconvincing as a gruff mercenary. Chinese mega-star Jing Tian? I think she speaks twice, and is here simply to exploit the Chinese box-office. The vastly under-rated Toby Kebbell? Arguably the most under-used of all the cast; when will this guy get a role worthy of his talents? As the many characters begin to get knocked off by a combination of Kong, giant spiders and not-dinosaurs, none of their deaths have any impact, and there's a severe lack of tension, as we simply couldn't care less which of these cardboard cutouts makes it off the island. The only character that feels any way fleshed out is John C Reilly's Hank Marlow, a pilot who crash landed during WWII, as seen in an impressive pre-credits sequence. Kong: Skull Island certainly has its moments, and if you see this on a big enough screen you'll get your share of spectacle, though seeing Kong in action on his home turf is nowhere near as visually interesting as witnessing him destroy New York. Ultimately, despite its scale, it's an often underwhelming and largely soulless experience, a movie so obsessed with delivering its giant special effect it neglects to add a human heart. After two movies in the battle of the beasts it's Godzilla 1 King Kong 0. 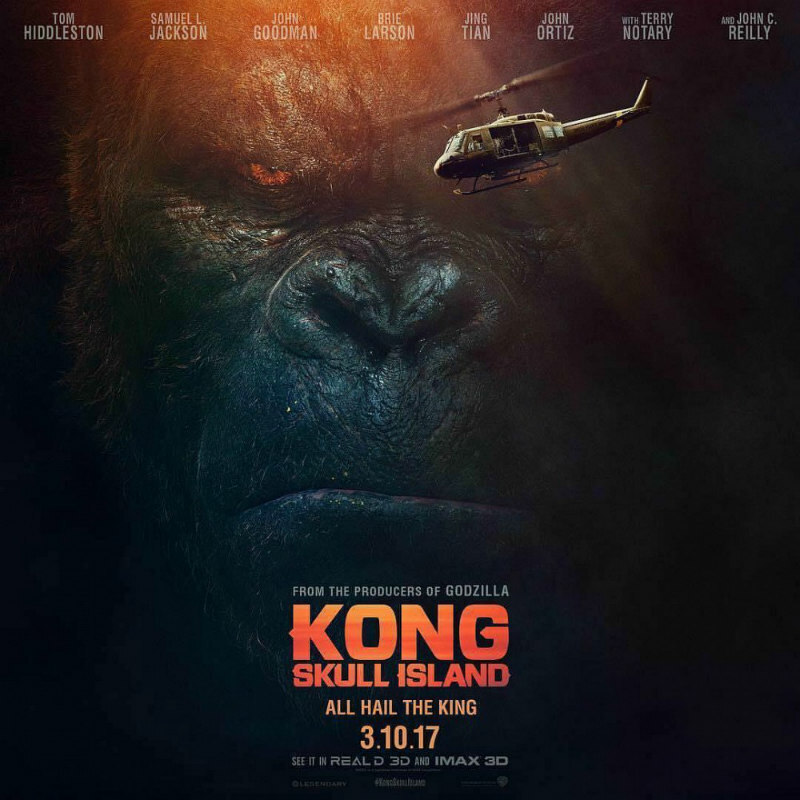 Kong: Skull Island is in UK/ROI cinemas March 10th.